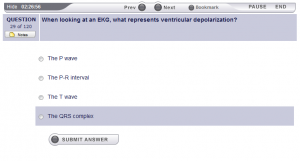 Our questions are designed to simulate those found on the NREMT-Paramedic Cognitive Exam. Covering each of the five core exam areas, every question comes paired with an answer that explains the answer and connects the theoretical EMT knowledge to real-world-applications. Each of our practice questions and accompanying answers was written and edited by certified EMT experts, so you can be assured of accuracy and relevancy. You can review your exams at any time, to track improvements and the areas you need to focus on most. EMT Exam Ace’s EMT-P Cognitive Exam Preparation Package also includes exclusive access to glossaries and test taking tips. All of our material is available for unlimited 3-month individual access for only $49. Our EMT-Paramedic study materials are presented using TestConquest‘s state-of-the art learning management system. 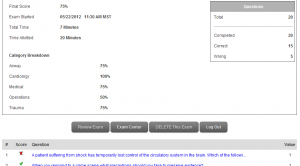 We are 100% confident that by using our materials you will pass your exam. If not, we’ll extend your account until you do. That’s our guarantee!